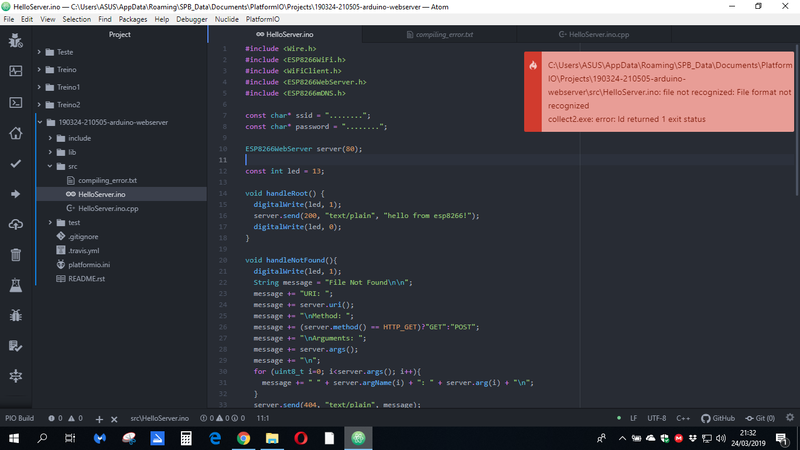 Hi, I started using platformIO today using Atom and I can’t run any program, including the examples as you can see in the picture. It seems it can’t read any of the ESP libraries, same happens if I try to include any arduino or avr libraries at the beggining. You would be better off using VSCode instead of Atom as the IDE… it appears to be the better supported and preferred IDE. Also, you may want rename the file to have .cpp as the file extension instead of .ino, or if your HelloServer.ino.cpp file is already a copy of HelloServer.ino, delete the HelloServer.ino. As the error states .ino is not supported/recognised! The error still remains, it appears platformio can’t find any include library. Like arduino, avr or esp. I can’t run any example project. Like a typical error is arduino.h file directory not found. Can someone help me with this? Do you have antivirus tools in a system? It seems that they block PlatformIO.